The Desert climate is harsh. Living or operating a business in the Coachella Valley forces us to deal with temperatures that exceed the national average. Residential misting systems help “take the edge off” in the spring and are an absolute necessity in the summer. Our residential misting systems are high-pressure misting systems, manufactured using the highest quality components and designed with an eye on continuous duty operation. The advantage that Valley residents enjoy is that we are based right in Thousand Palms. That means that systems are installed by factory trained personnel and serviced by the same. Our systems are respected worldwide by clients around the globe. 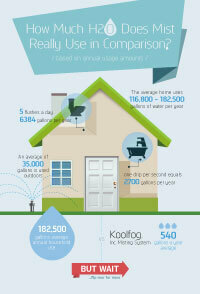 To find out more about Koolfog misting systems please visit our corporate site. You can explore in depth information on our high-pressure misting pumps, misting nozzles, fog nozzles, misting fans and more. 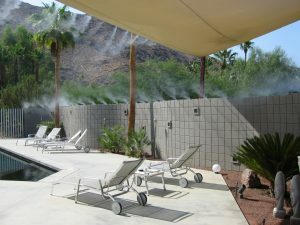 If you live in Palm Springs, Cathedral City, Rancho Mirage, Palm Desert, Indian Wells, La Quinta, Indio, Bermuda Dunes or any of our Desert cities you are sure to see our misting systems in use at local businesses and residences across the Valley. What many people don’t know is that Koolfog also produces visual fog effects and a stunning visual effect for backyards. Our state of the art fog nozzles allow for fog effects to mimic characteristics such as smoke, dense fog, precipitation, and soft landscape mist. Koolfog fog solutions are used to highlight architectural elements and focal points such as fountains, ponds, and pools. In addition, water fog systems are used to produce low lying fog or a background for waterfall and lighting displays. Fog mist systems are installed as privacy screens or barriers for estate homes, covered patios, and spas. Fog also provides residual cooling. So there are more benefits to adding fogscapes to your outdoor setting when temperatures start to rise. Not only that, but the same high-pressure misting pump that is used to drive your outdoor cooling system can be extended to create those high-pressure, pure water fog effects. HOW MUCH H20 DOES MISTING REALLY USE? 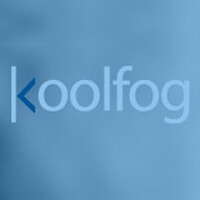 What is the Koolfog Comfort Club?